With shops located in Canyon Lake and Wimberley we are in very close proximity to some of the best fly fishing Texas has to offer! From Rainbow and Brown Trout, to picky Carp, chunky Largemouths, and our state fish the Guadalupe Bass, we are well diverse in our targetable species. We are able to accommodate groups of all sizes with our fleet of boats and experienced guide staff. Our trips include everything necessary for a day on the water (waders, boots, fly rod setups, tackle) as well as an ice chest with refreshments and a lunch for our full days. The Guadalupe River watershed begins in Kerr County and eventually drains into San Antonio Bay on the Texas Gulf Coast. Along this course, the river is dammed up at Canyon Lake. The section between the lake toward the US 281 Highway Bridge is fished year around but is primarily known for the spring White Bass and Striper run out of the Lake. The upper run of the River holds good populations of Guadalupe Bas, Smallmouth Bass, Largemouth bass, Rio Grande Cichlids, Pan fish, and multiple species of Carp. Below the Canyon Lake Dam is where the tailrace of the Guadalupe River is formed, and where our float trips take place. 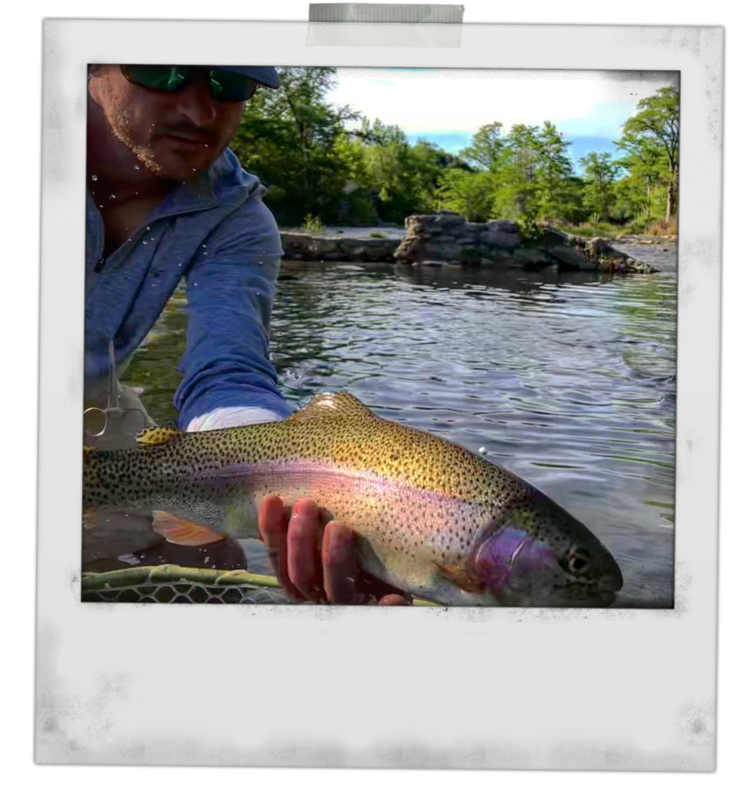 Being named as one of the top 100 trout streams in the United States, as well as being the southernmost trout fishery in the US has brought much deserved attention to the fishery. Though the main attraction is our trout season which runs from October until May, the River offers excellent Bass angling opportunities as well with its diversity in species. Trout are stocked from November through March every year with many fish surviving year around. Our trips are floated, though we can arrange a walk and wade, in 14’ AIRE Whitewater Rafts, where you and your fishing companion will be taken down the river with one of our experienced guides. New and seasoned fly fishers alike will have excellent opportunities to hook 20" plus trout on this trip and personal bests are not uncommon! The Colorado River starts its journey just south of Lubbock, TX and flows Southeast through the Llano Estacado, Texas Hill Country, and eventually drains into Matagorda Bay. Lightly pressured and heavily populated with game fish, the Colorado River provides excellent fly fishing for many different species of Bass. With Largemouth reaching close to double digits and holding a solid Guadalupe Bass population it’s no wonder why we fish this river. Out trips are taken out of a skiff or motorized float boat which provides plenty of room for our anglers. Though we have many great rivers in Texas, the San Marcos is unique as the heart of it starts right on the edge of the Texas Hillcountry. It is regarded as one of the most biologically diverse aquatic ecosystems in the Southwestern United States. Bubbling up from San Marcos Springs in the middle of San Marcos and the Texas State University campus, the river is crystal clear and resembles an aquarium. As it flows southeast out of town the river takes on a darker green hue and is surrounded by areas of lush habitat. With constant flows, great aquatic vegetation, and a predominantly deep river bed, this watershed has all of the key factors for being a prime time fishery, and it is! We float this trip in 14’ AIRE Whitewater Rafts with plenty of room for two anglers. Expect good fishing and beautiful scenery. Another great option for fly anglers looking to book a trip with us is a Hill Country Walk and Wade trip on one of our scenic rivers. As it sounds, this trip will be taken on foot with a guide. Options are dependent on water flow, season, and fishing reports so please call or email us to discuss what is available. Rivers and creeks include the following; Blanco, Guadalupe, Llano, Pedernales, Lampasas, Brushy Creek. Expect a wide range of target species…did someone say Carp?